The TIR-FOR project: a retrospective perspective. TIR-FOR is a project promoted by the International Union of Academies (UAI) that results from a methodological and conceptual unification of two projects, entitled Tabula Imperii Romani (TIR) and Forma Orbis Romani (FOR). Two leading projects in the last century related to the ancient cartographic topography of the Roman world, designed as an extensive scientific collaboration between countries. The progressive application of new technologies to these two projects led to the UAI deciding, at its General Assembly in 2004, to unify both projects. In the belief that, with new applications, the FOR project would serve as an extension and addition to the TIR project for certain regions, especially those with a wealth of written documentation or archaeological finds from ancient Roman times. 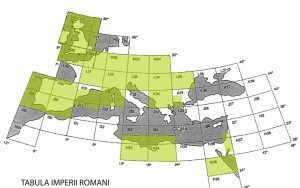 The aim of Tabula Imperii Romani is to provide a cartographic summary, with files and notes, of all research into ancient history carried out in countries that formed part of the Roman Empire. 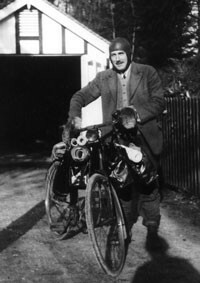 In 1928 O.G.S. Crawford, a geographer who focused particularly on archaeological studies, came up with a project to produce a “map of the whole Roman Empire” based on the International Map of the World (IMW) and using a scale of 1:1,000,000, subdivided into 56 sheets, taking as an example the map of Great Britain produced by himself. After the Second World War and an enforced period of silence in terms of publications, the project was brought under the auspices of the UAI and extensive work resumed in this area. As a result, in 1953 the UAI set up a Commission to be responsible for the TIR which, since the very beginning, has worked with a spirit of broad international collaboration. Given the nature and aims of the project, at first strict rules were not established for producing the initial volumes and each editor was free to chose the form and content that best suited the information extracted from the body of research in each particular region. However, later on the guidelines provided by the International Commission, and especially the contributions made by G. Lugli, tackled the problem of the need for specific criteria to select the information to be included in the map. In 1931, in Paris, a prototype was presented for drafts of the first four sheets: N-30 (Edinburgh), K-33 (Rome), and two Spanish sheets, K-29 (Porto) and K-30 (Madrid), followed by the preliminary versions of the sheets K-32 (Florence), J-32 (Tunisia) and J-33 (Palermo). But it wasn’t until 1934 when the first definitive publications finally appeared: O-30 (Aberdeen), H-35 (Alexandria), H-36 (Cairo), G-36 (Aswan) and F-36 (Wadi Halfa). Other provisional maps were also presented at the same time, for which only three sheets were published in the subsequent years: L-31 (Lyon) in 1938, N-30 (Edinburgh) in 1939 and M-32 (Mainz) in 1940. After the Second World War and a hiatus, the project became part of the UAI’s programmes and work was resumed. This renewed effort immediately led to Great Britain sponsoring the publication of two African sheets in 1954: H/I-33 (Leptis Magna) and H/I-34 (Cyrene) and a revision of the Aswan sheet in 1958. This was followed by the publication of the M-33 (Prague) in 1955, while in Italy the first sheet, directed by G. Lugli, was presented in 1961: namely L-33 Tergeste (Trieste). In 1965 the editorial tradition was broken with the publication of the book TIR. Drobeta – Sucidava, but re-established the following year with the publication of sheet L-32 (Mediolanum – Aventicum – Brigantium), followed in 1968 by sheets L-34 (Aquincum – Sarmizegetusa – Sirmium [Budapest]) and L-35 (Romula – Durostorum – Tomis [Bucharest]). In 1975 a part of sheet M31 (Lutetia – Atuatuca – Ulpia Noviomagus [Paris]) was published in France, with some interesting changes regarding the scale used: the main maps continued to be shown with a scale of 1:1,000,000 but more detailed maps were also added (Bagacum, Camulodunum, Lutetia, Ulpia Noviomagus, Samarobriva). This criterion was also adopted by sheet K-34 (Naissus – Dyrrachium – Scupi – Serica – Thessalònike [Sofia]) in 1976. Nevertheless, by the early 1980s there were still only a few completed sheets and others that had been partially or provisionally published. 1983 saw the publication of some maps for England, including sheet M-30 (London) and part of M-31 (Paris), entitled Condate – Glenum – Londinium – Lutetia. Two years later, following a similar procedure, the single volume entitled Britannia septentrionalis was published, containing sheets N-30 (Edinburgh) and O-30 (Aberdeen) as well as parts of sheets N-29, N-31 and S-29. In the preface the authors stated their desire to complete the British series following a unified criterion not based on the traditional subdivisions of the sheets. In 1993 the Spanish Commission of the Tabula Imperii Romani started publishing the Tabula again, presenting sheet K-29 (Conimbriga – Bracara – Lucus – Asturica [Porto]) in accordance with quite an innovative formula. The subsequent maps of K-30 (Caesaraugusta – Clunia [Madrid]), J-29 (Emerita – Scallabis – Pax Iulia – Gades [Lisbon]) and K/J-31 (Eastern Pyrenees – Balearic Islands) coincided with initial developments for a computerised data management system. Several publications have enhanced this project since: the part of Greece (Philippes) corresponding to sheet K-35 (Istanbul); the part of the Palestine-Judea province published by the Israel Academy of Sciences and Humanities; and sheet M-34 (Kraków) presented by the Polish Academy of Learning (Polska Akademia Umiejętności, PAU) with the collaboration of a further five countries, applying the spirit of international involvement established since the early days of the project and encouraged on many occasions by the International Commission, presided over at that time by Professor Paolo Sommella, in the technical meetings held as from 1992 in the different countries involved in the project (Madrid, Barcelona, Nice, Kraków, Rome (3)). And finally, in the next few years, sheets J-30 (Valencia) and K-32 (Florence) represented, on the one hand, the complete coverage of the region of Spain and, on the other, a scientific collaboration used to study the French-Italian Tyrrhenian coastline. Moreover, the system now enabled the editing of information at a detailed level, applied to the map with the scale 1:1,000,000, thanks to computerised data location resources and links between records and maps. In 1921 the project entitled Carta Archeologica d’Italia was sponsored by the UAI, proposed by the Italian senator R. Lanciani, in 1923 taking the name of Forma Orbis Romani (for Italy Forma Italiae). In 1928 the Forma Conventus Tarraconensis also joined this project. These are the names used today by the Forma Orbis Romani to continue publishing archaeological maps in Italy (UAN, Rome) and in Spain (IEC, ICAC, Catalonia) with around fifty volumes published in total. France, which was initially associated with this enterprise, continued along its own route independently carrying out the publication of the Carte Archéologique de la Gaule. The Forma Orbis Romani is actually an extension of the Tabula Imperii Romani using more detailed maps. Extremely detailed archaeological maps are used to reconstruct the ancient territory, normally at a scale of 1:25,000, or maximum 1:50,000, allowing for geolocation with precise coordinates. In addition to being useful for historical research, this work is also important for the conservation and use of archaeological heritage in the territory and the resulting documentation and maps provide a reliable tool for historical and archaeological research as they are based on information from a direct archaeological analysis on the territory and from accounts stored in the archives. The method is based on digitalised location of data on the map (see www.formitaliae.it), within a complete documentary framework that contains all visible remain s and also those that have disappeared but are stored in archives or bibliographical files. The methodology established helps: a) To extract information from the general and specific bibliography of the area in question and investigate public and private archives; a direct analysis on the ground: to identify and produce files and possible photographic documentation for new sites; to create detailed maps and produce new cartographic documentation (elevations, sections, axonometric projections) in line with the traditional system; b) To control, on the ground, all the information provided by remote detection systems (aerial photography, satellite information, etc.) regarding any remains and anomalies that are likely to provide elements of interest for the project (monuments, thoroughfares, centuriation, paleosol, farming settlements, etc. ); c) Topographic elevations using a system of absolute coordinates for all the elements identified and related to maps. This means that sites can be located on any map and at the scale required by the user, who might not be an archaeologist (local administrations, etc.). The most recent work has also involved in the application of new measurement tools, such as G(lobal) P(ositioning) S(ystem). 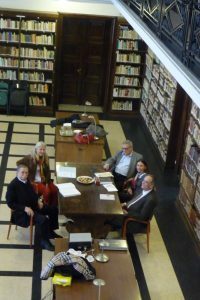 The TIR-FOR project: towards global digitalisation. In 2014 the TIR-FOR International Commission and all its member countries agreed to work on digitalising the data by applying a unified approach, distributing these data online and thereby creating a single database for the whole Roman Empire. Each research team is now working with this database based on its own territory, thereby multiplying the project’s potential and with the aim of extending its use to broad sectors of the population. The objective agreed by the Commission is to take advantage of new information and communication technologies to update and develop a fundamental tool capable of disseminating knowledge related to our archaeological heritage from the Roman world both quickly and intuitively. Such a tool, initially conceived in the early 20th century, comes to enhance our knowledge and enjoyment of our common past.